Today is our "explaining monsters" day. So after our previous post on otters, we will look into swimming deer. 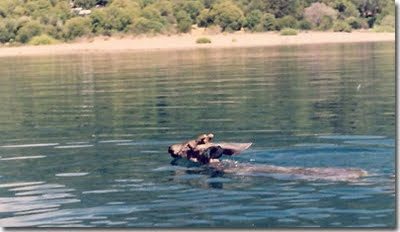 Most people ignore that deer are good swimmers and would not expect to see one in the middle of a Patagonian lake. As you can see in the photograph (which shows a swimming Huemul at Lake Futalafquen in the Los Alerces National Park, Chubut, Argentina), they are an odd sight. The huemul (Hippocamelus bisulcus) is a stocky Patagonian deer that is about 1 meter (3.3 feet) tall and 1,65 m (5.4 ft.) long, and weighs between 40 and 100 kg. (88 - 220 lb.). Like all deer, males have antlers about 30 cm (1 ft.) long. Interestingly they escape persistent pursuers by swimming into lakes. They can swim with ease and are indeed an “amphibious” creature. In northern Patagonia, Red Deer (Cervus elaphus) one of the world’s largest deer species were introduced from Europe in the early 1920s. Lacking predators they reproduced quickly and displaced the native huemul from its habitat in this area. They swim well and have a big body mass. Any one not acquainted with these beasts could mistake them for strange lake beings. Take a look at the photograph below (not in Patagonia, and not a Red deer) it is incredible. 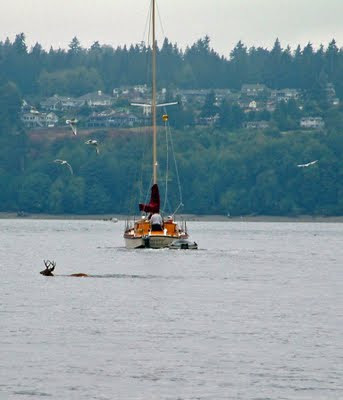 Blacktail Deer and sailboat, Gig Harbor/Pt. Defiance. Photo: John Pleau. From .